I enjoy hunting, a lot. And I really like elk hunting, it's got to be my favorite. However, I'm not sure I've ever had a better time than we did in Texas last week. I was laughing from the moment the guys got in my car until the moment I dropped them off. 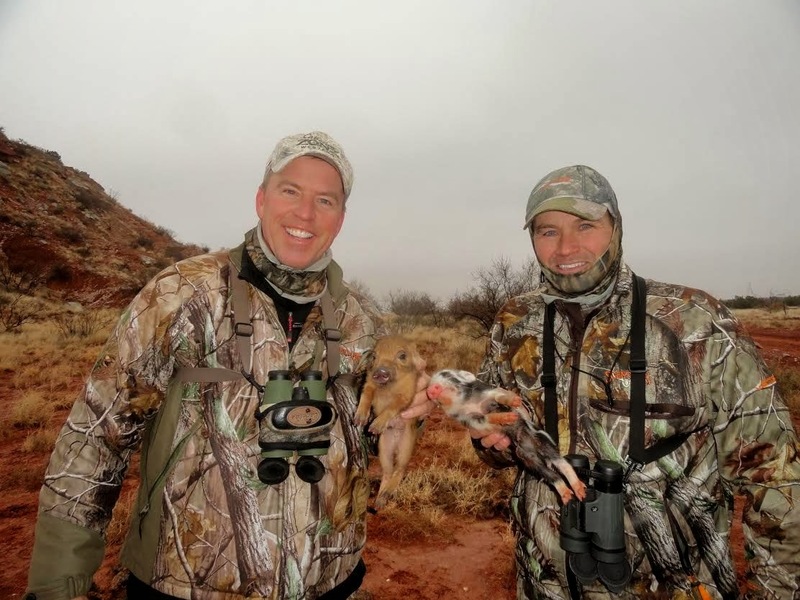 We returned to the same ranch we hunted last year (story here). A group of us from RMSGear headed south, met by my cousin Chad and some of his Nebraska buddies. The weather was pretty chilly for Texas. When we got there we had a little bit of blowing snow and high temps in the 20's. The pigs moved later in the day, but that didn't stop us from getting out early the first morning. Everybody went out, but nobody got shots. We calmed down the next few days, and like the pigs, slept in a little bit before starting our onslaught. The country in this part of Texas is made especially for bowhunters. I love the brush down there, open enough to spot the animals but dense enough to get your sneak on. I thought that the pig sign last year was impressive, it was nothing compared to this year. The pigs are taking over, and their presence is obvious around every bush and tree. Stalking in this country cannot be beat. We didn't see see the sky for the first two days, but on day three we were treated with a really nice sunset. Even though the first morning started slow, by early afternoon the arrows were starting to fly. My brother and I were making our way through my favorite area from last year when we spotted a group of pigs heading towards us. We quickly found a hiding place and waited for the pigs to come. Danny was up first. He didn't waste his opportunity. 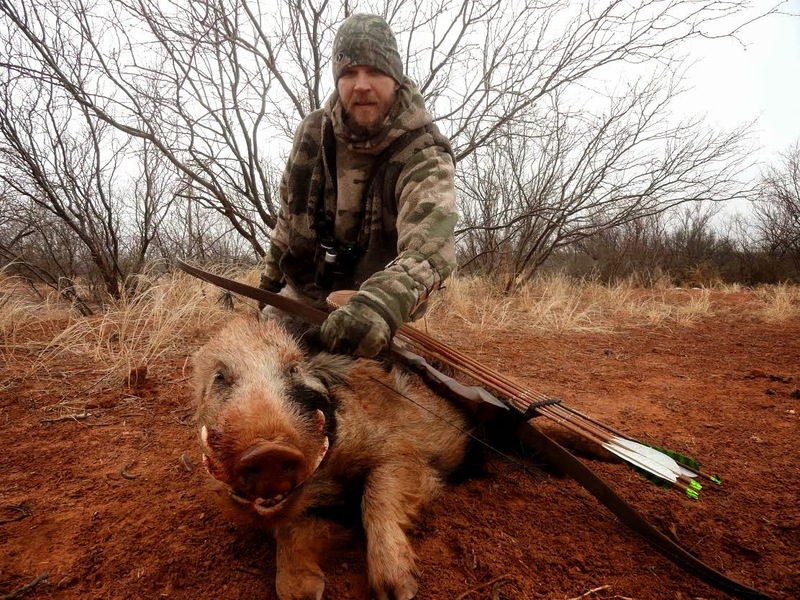 Danny's arrow hit the pig with a loud whack and dropped him where he stood. The other pigs ran up to see what was going on, and before the dust started to settle my cedar shaft was in the air. The same time Danny and I were dragging pigs to the truck Blake was skulking towards this nice boar. Blake got a little too close, and the pig got nervous when he saw a figure in the grass just three yards away. 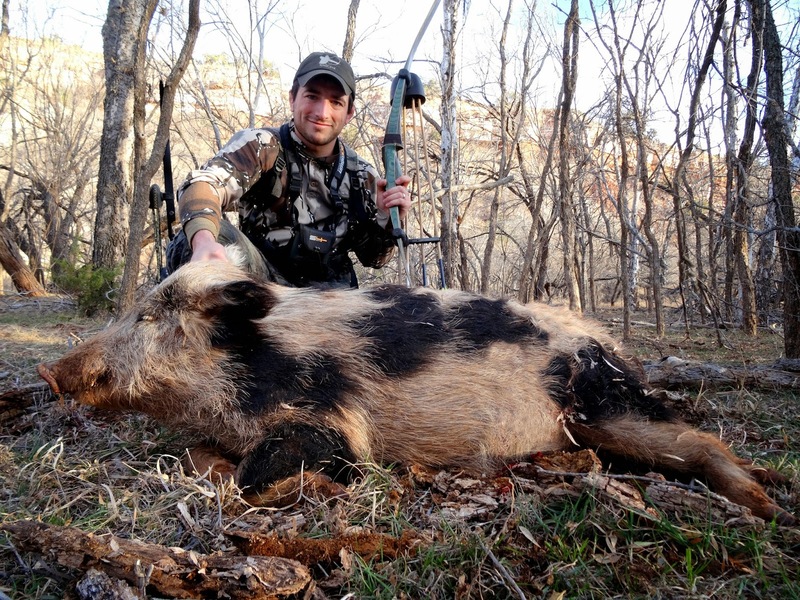 The pig started to move away, but Blake made the best of it and drew his bow as the pig was trotting off. The big boar slowed down just enough for Blake to make a perfect shot. 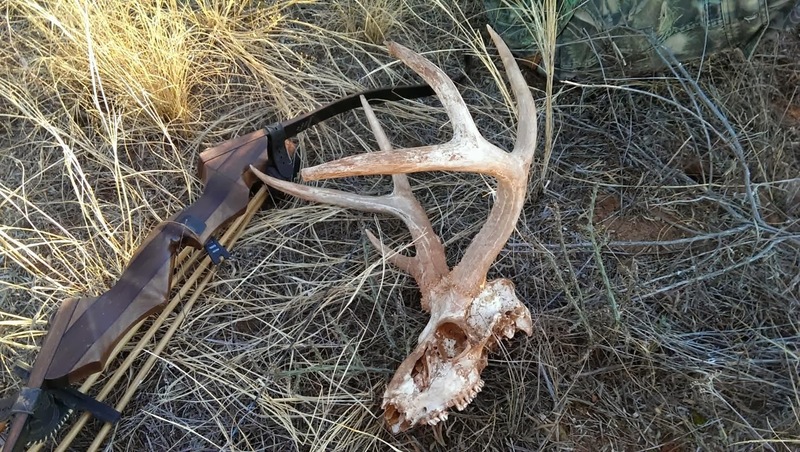 Blake used a Chargin' Bull recurve. 60", 55@28. Blake and Chad started building bows a year ago, they are fantastic. He's shooting CX Heritage arrows, his quiver was a smorgasbord of broadheads. We found three pig nests with little babies. How can something so cute turn so ugly? Mike and Tab killed a few pigs each, these guys didn't play around. On the second evening of the hunt I discovered pig paradise. I grabbed my cousin, Chad, for the following day. We crept along the edge of a bluff above the Brazos river. Since the time we were little kids, Chad and I have always got into the animals. Chad killed his first deer with his 13 year old cousin at his side (me), and the following year I called in my first bull elk to Chad. To this day whenever we hunt together we are in the thick of it. In no time we spotted two groups of pigs below us in the brush. We let the wind choose which group of pigs to sneak up on. These have to be the perfect bowhunting animals, good enough senses that you need to be sneaky, but blind enough that a guy has a great chance of success on each stalk. I brought my 21st Century longbow on this trip. I've had the bow for 5 or 6 years but never took it hunting. I was a little worried about stalking with a 64" bow (I usually like 'em short). It's not a pretty bow - weird green color, Holmegaard limb profile, brush nocks, and 63 pounds. This bow only has about 8 inches of working limb, and I love how it throws my arrows fast and hard. My concerns over length proved unfounded, Chad and I were easily able to crawl on our stomachs to within bow range. The only difficult part about the stalk was avoiding all the pig poop, it felt like crawling through a dog park. P.I.G. P.A.R.A.D.I.S.E! After I killed the first pig we wasted no time in getting back on top of the bluff. It didn't take long to find another group with a bunch of big ol' hogs. Chad slinked in, the smallest pig of the group stepped into an opening. Chad made a chip shot and the pig didn't run 30 yards before falling. It was the smallest of the group, but the biggest any of us killed on the trip. 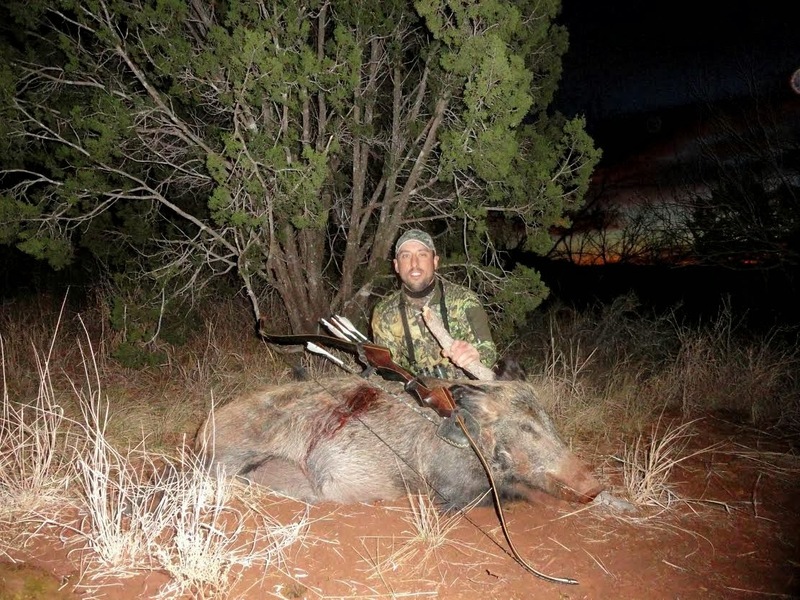 Chad used a Chargin' Bull bow of his own making. His bow is 60" and 57@28. There isn't anything on earth more fun than razzing the guy who has had the worst luck. On this trip, that just happened to be Del. In three days of hard hunting Del had yet to shoot an arrow, and he only got a small glimpse of a pig. Before this trip the Nebraska guys didn't know Del other than by the crazy elk hunting stories we told about him. Del's lungs and legs are a thing of legend, and he kills more than his share of elk. On day 3 of the 4 day hunt, the Nebraska boys started to call him Tebow - all hype and no show. Del got a good laugh at himself, and being that we were pig hunting, I started calling him Teboar. Chad, Danny and I decided to show Del some mercy and teach him how to hunt pigs. We brought him to our perch, and in less than two minutes we spotted a lone boar feeding near the water's edge. Zoomed all the way out, the pig is in the center of the frame. Zoomed all the way in. After spotting the pig, Chad and Teboar (Del) got off the bluff and started their sneak. Danny and I stayed above to watch the show through our binoculars. True to form, Del did pretty much the opposite of what I would have done, he took his boots off so he could move silently in the water. When he got close to the pig he got on shore. His bare feet falling on the mud made, quite literally, no noise at all. Del closed the distance on a totally unsuspecting boar. Del's Spirit longbow launched a Carbon Express Heritage arrow, tipped with a scary sharp Bear Razorhead. Danny and I had the second best view of the whole thing from our vantage point on the bluff. Internet, get ready for a new meme - Teboaring (I know, I know, that's so 2012). We cut up the pig and returned to our outlook high on the bluff. Chad and Danny headed South, Del and I headed North. Del and I sat down to drink a Mountain Dew before searching in earnest for our next stalk. It didn't take more than a minute to spot another lone pig on the river's edge. Del and I crossed the river and made our way to the bank, directly across from the boar. I looked over my shoulder and gave Del a droll smile before lifting my bow to shoot. He smiled back. This was serious fun. My arrow zipped through the pig in a blink but it wasn't an ideal shot. Del was Johnny-on-the-spot with a follow up shot, driving his arrow straight through the boar's chest. The boar ran down the river a very short ways before falling over in the water. This picture is taken from where the pig was standing, looking at the spot where Del and I peaked over the grass to shoot. The pig hardly had time to run before Del's arrow buried in the dirt, not at all far from mine. We made our way back on the bluff and spotted another pig immediately, a true giant. With daylight running low and swirling wind, I did the best with what I had. I was peaking over the grass at the last place I saw the monster swine, ready and expecting to ease my bow back at any moment. But the big pig was gone. He must have smelled me, my only blown stalk in four days of non stop action. Not bad odds, I can't wait for next year! Email me, tlc@rmsgear.com, for the contact info for the ranch. It's 22,000 acres of pig hunting madness. You can bait roads, sit on feeders, or do like we did, and get in the pig's bedroom to stalk them. Jay runs the hunts, he's a traditional bowhunter who treats us the exact way I'd hope to be treated. Just bring a lot of arrows when you go. We put 14 pigs in the barn, and I fully expect that we kill more next year with our new method of hunting them from above. Your hunting trip is memorable. I like the feeling of being with my teammates and hunting like that. Thank you for your article.